I just received this fantastic book from the folks at Amazon. 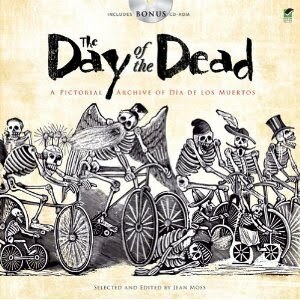 Day of the Dead: A Pictorial Archive of Dia de los Muertos by Jean Moss is, at a little less than fourteen bucks, an amazing buy. Included with the book is a CD with ALL 187 of the images enclosed on it. Virtually every José Guadalupe Posada woodcut associated with Dia de los Muertos is included, among the works of other artists. Best of all, the images are royalty-free! Hi! I just found you through google. I was looking for an image about the day of the death to use on my blog and just wanted to make sure it was ok with you. It is an image with to skulls and it was posted in 2008. I just came across your blog and greatly enjoy it! I will be following as Dia de los Muertos draws closer. In your opinion, who would you consider the most interesting Dia de los Muertos expert? To be honest, I don't know if there is a singular Dia de los Muertos expert. There are many great books, however, and that's a definite starting point! Hi Abby! It is fine with me, if you don't mind crediting this Web site...www.diasdemuertos.com. Thank you!